This article explains the TEKLYNX CENTRAL / LABEL ARCHIVE error message “No permission to view these items” and details how to fix the underlying problem that caused it to appear. 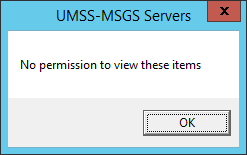 This message indicates that the logged in user does not belong to a group with permissions to access that part of the UMSS-MSGS console. The UMSS-MSGS screen has several nodes accessible using the left hand navigation (Users, User Groups, Applications, and Sessions). If the “Execute” checkbox in the Administration section is unchecked and the user attempts to access that node, they will get this error message and the ability to access data in that section will be blocked. The administrator needs to be careful not to let conflicting permissions exist. There are times when different permissions within UMSS can conflict. 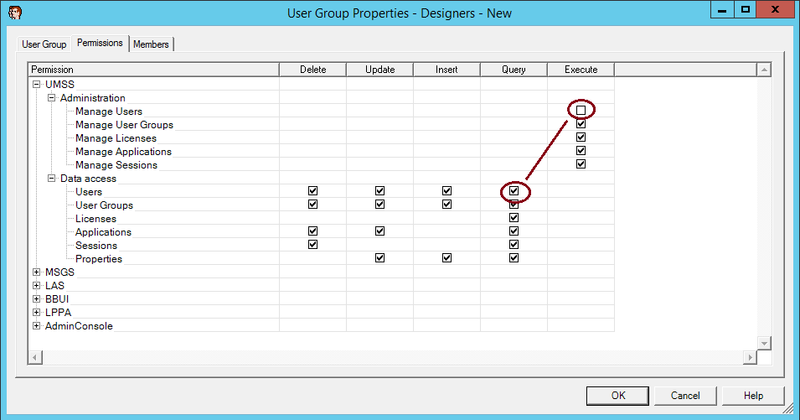 In the example below, the User Group has full access to the USERS table. However, with the “Execute” permission unchecked, they will not have access to the screens in UMSS needed to utilize that access.